We could use your energy and help while you visit! Some of the Raleigh area&apos;s greatest assets are its friendly people who are on a mission to help others. More and more, meeting planners are asking how they can support the Raleigh area&apos;s causes while their attendees are meeting here. We call this voluntourism. Not only does it give the visiting attendees new and positive experiences, but also it makes a positive impact on our destination. Visit Raleigh has partnered with Activate Good, which can assist you in choosing the best contribution for your group. Activate Good is a nonprofit volunteer center that activates volunteers to help charitable causes in Raleigh and the Research Triangle Region. 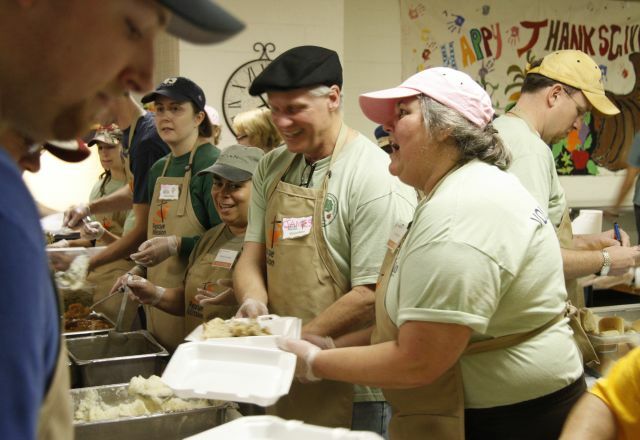 The organization connects individuals, groups and companies to volunteer needs with hundreds of nonprofits around the area. Browse hundreds of volunteer needs and sign up for the opportunity of your choice. See opportunities for individuals. Activate Good makes it easy to include volunteer opportunities in your event&apos;s schedule, providing turnkey team-building service project planning services. Work with the experienced, knowledgeable Activate Good team to customize volunteer efforts for your initiative quickly and easily. Off-Site Service Projects: Activate Good will coordinate your service project(s) from start to finish. They can help you select the perfect project and worksite that fits your interests and needs, handle logistics and registrations, provide on-site leadership and collect testimonies from participants and hosts to report back to your team. All your team has to do is sign up and show up! Portable (On-Site) Service Projects: Activate Good can bring the service project to you! They customize a portable service project based on your needs and event space, transport supplies, provide leadership and instruction and collect testimonies from participants. When the project is complete, Activate Good delivers finished products (if applicable) to the benefiting cause. Is your organization a 501(c)(3) tax-exempt public charity, or does your event benefit a charity? You may be eligible to promote your event&apos;s volunteer needs through Activate Good. Read about Activate Good&apos;s nonprofit partner eligibility requirements. Questions? Contact volunteer@activategood.org.